An eighteenth century listed building, with an interesting history and visitors that have included Jacqueline Kennedy and Noel Coward, is the latest in a long line of establishments to take advantage of the cost savings that accrue from the installation of P50 fire extinguishers. Turville Grange, near Henley in Oxfordshire, is the country retreat of an influential American family. The estate covers several sites including a large regency style house and is used by the family as a residence for around six months of the year. It is looked after by seven full time staff. Buildings of this nature have high running costs and every effort is made to reduce expenses. One of the costs is fire safety; fire extinguishers are spread across the property and, over and above the initial outlay, the cost of having them serviced annually was a drain on the maintenance budget. Through a chance acquaintance, Safelincs was recommended as a company that might be able to offer a more economical solution. Safelincs introduced the management at Turville Grange to the P50 extinguisher. Manufactured entirely from materials that will not rust or corrode, these appliances do not require an external annual service; a simple yearly check easily undertaken by one of the building’s own employees is all that is required. They also do not require a refill after five years like traditional extinguishers. Instead, after ten years, they are factory-refurbished and can then be used for a further decade. “Installing P50 appliances will save us hundreds of pounds in maintenance costs,” said Adam Brimley, who manages the estate. “In addition, Safelincs gave us invaluable advice on the placement of the extinguishers that enabled us to significantly reduce the numbers that are required. 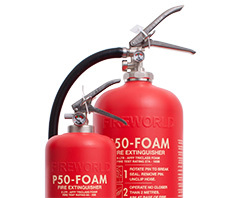 If you want to benefit from the cost savings the P50 extinguishers offer, contact Safelincs on 0800 612 6537 or email support@safelincs.co.uk, our professional advisers are happy to help.